When you subscribe to the MOOCAP newsletter, you can indicate which of these topics you are most interested in. We will then notify you when the course (or courses) you are interested in are open for registration. The purpose of this course is to show how design innovation can be encouraged by thinking about accessibility. Examples will be drawn from innovative areas like smart homes and ‘ambient assisted living’, as well as everyday encounters with ubiquitous self service kiosks. The course will also cover some foundational tenets of inclusive approaches, such as the social model of disability, legislation and standards,ergonomic and business aspects. In the last few years, sales of mobile devices have surpassed PC sales. Mobile devices can be extremely useful for people with special needs: they provide great computing memory capacities associated with permanent digital network access and minimal space and weight. This course will show the principles that ensure that mobile applications are not restricted to mainstream users, but can also fulfil the requirements that make them accessible to everyone. Practical exercises that can be done on the main mobile operating systems will be proposed and explained. In the course “Accessible Web” you will learn how to develop accessible HTML5 web pages. In particular, we will explain the basics concerning structure and design and we will dive into the details of accessible input elements and dynamic content. 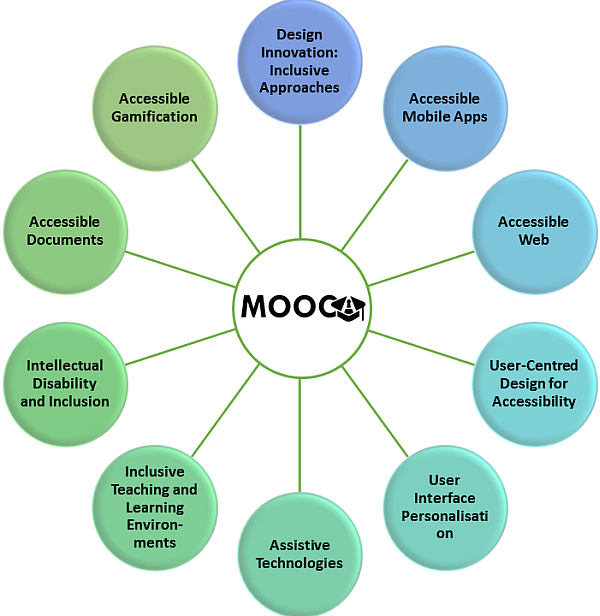 This course will focus on involving users in the design and development of accessible ICT systems. It will cover what user-centered design is, why it is important, and how to use it to ensure accessibility of your ICT systems. This course teaches how user interfaces can be made adaptable and adaptive to a user’s individual needs and preferences. Code examples will cover various platforms. The course will also introduce the Global Public Inclusive Infrastructure (GPII) framework. Assistive technologies (AT) are technologies which help people with special needs to live independently, to learn and work, be active and participate in society. The course “Introduction to AT” will describe the various kinds of AT that are currently available will be described, what can be expected from them and how they can be used to enable what used to be impossible for centuries. Particular attention will be given to the connection between AT on the one hand, and mainstream technology and the practical requirements on the environment on the other, i.e. requirements that need to be fulfilled so that AT can work in these contexts. These requirements are usually grouped under the heading “accessibility”. This course will cover aspects of digital accessibility related to the learning and teaching environments experienced by students, teachers and support staff in the post-16 educational setting (universities and colleges). It will explore the barriers experienced by those with disabilities, and strategies for creating, communicating and collaborating to make these environments more inclusive. This course looks at the accessibility challenges those with intellectual disability face. It will consider Assistive Technology for people with Intellectual Disability. It will particularly focus on assistive ICT and how this is properly developed in a user-centred design partnership. In the course “Accessible Documents” you will learn the basics of creating accessible Word and PowerPoint documents. Moreover, we will dive into the details of creating good image descriptions and the creation of forms, and we will introduce special document formats and contents such digital talking books (DAISY), accessible music, math and plain language. The course will start with an introduction to well-known gamification patterns and approaches. This will lead us to an interesting challenge: combining accessibility and gamification. To solve this, we will take one step back and look at digital games to find patterns that make them fun and entertaining. The course will guide you through a series of games, were we derive game design patterns to serve as basic building blocks for an accessible gamification approach.